Derring-do on a world of primitive monsters! When Robert Grandon swapped bodies with a prince of the planet Venus, he was concerned only with the thrill and interest of living on a different world. But the situation he found himself in was hardly that of a leisurely sightseer. Instead, he found himself smack in the center of a whirlwind of intrigue, danger, and desperation. 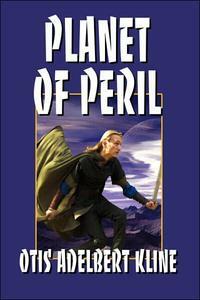 Planet of Peril is a science-fiction adventure on a world of semi-barbaric nations, ferocious beasts, gigantic reptiles, and maidens in distress!